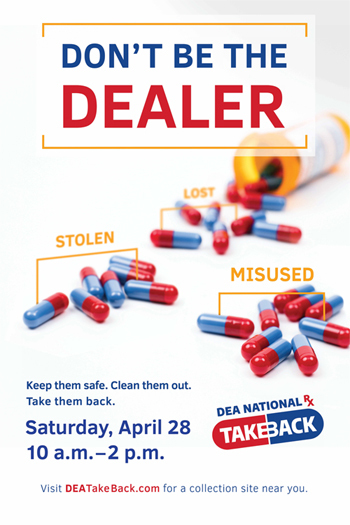 Buffalo, NY, April 12, 2018 - New York Sea Grant (NYSG) is encouraging the public to take expired, unused and unwanted pharmaceuticals to designated retail and law enforcement agency locations on National Take Back Day on April 28, 2018 from 10 am to 2 pm. “Proper disposal of unused medications is critically important to protect the public drinking water supply and the Great Lakes ecosystem. Take Back Day sites accepting these pharmaceuticals provide easily accessible drop-off points so everyone can do their part to protect New York’s waters,” says NYSG Coastal Education Specialist Helen Domske. Domske is also the Associate Director of the Great Lakes Program at the State University of New York's University at Buffalo. To find a 2018 National Prescription Drug Take Back Day authorized collection site, visit the U.S. DEA National Take Back Day Initiative Web site. New York Sea Grant offers "Return Unwanted Medicines" resources, which include information about the impact of keeping pharmaceuticals and personal care products (PPCP) out of the Great Lakes and other water sources. 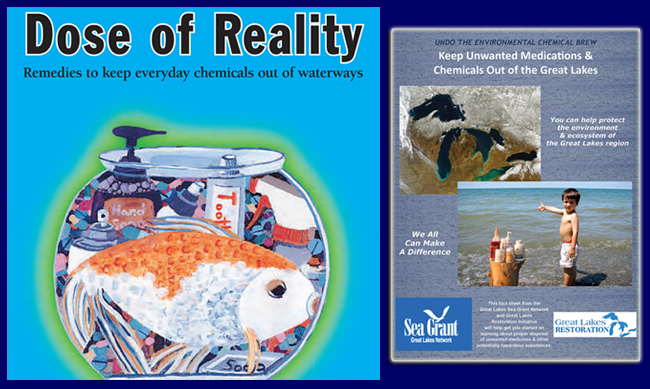 This information is well summarized in the ‘Undo the Environmental Chemical Brew: Keep Unwanted Medications and Chemicals Out of the Great Lakes’ guide developed by NYSG. 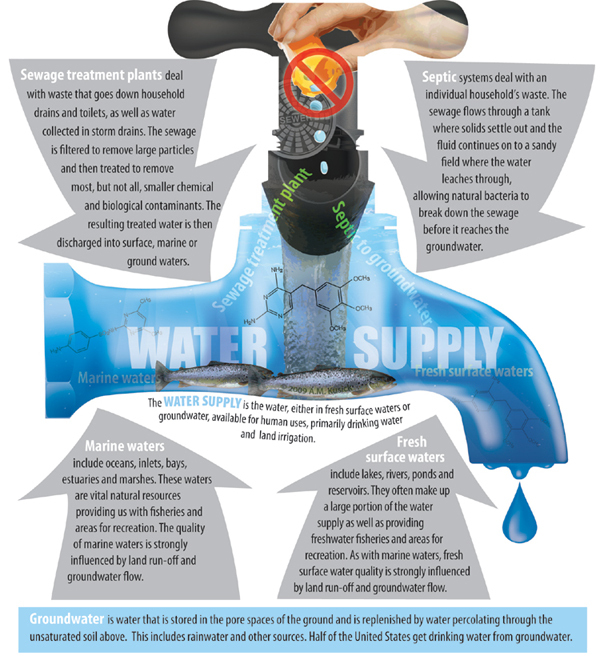 The guide lists 17 different types of PPCPs, including antibiotics, hormones, contraceptives, antidepressants, cosmetics, and vitamins, that are finding their way into the Great Lakes, the source of drinking water for 42 million people in the United States and Canada. In addition to its "Return Unwanted Medicines" resources, NYSG also offers a number of other "Green Tips for Coastal Living" via its Web site. Later this year, results are expected from a two-year NYSG-funded research project to examine the effectiveness of advanced water treatment options, environmental levels and the potential effects of pharmaceuticals in New York waters. This initiative addresses a vital public safety and public health issue. Medicines that languish in home cabinets are highly susceptible to diversion, misuse and abuse. Additionally, Americans are now advised that their usual methods for disposing of unused medicines—flushing them down the toilet or throwing them in the trash—both pose potential safety and health hazards. 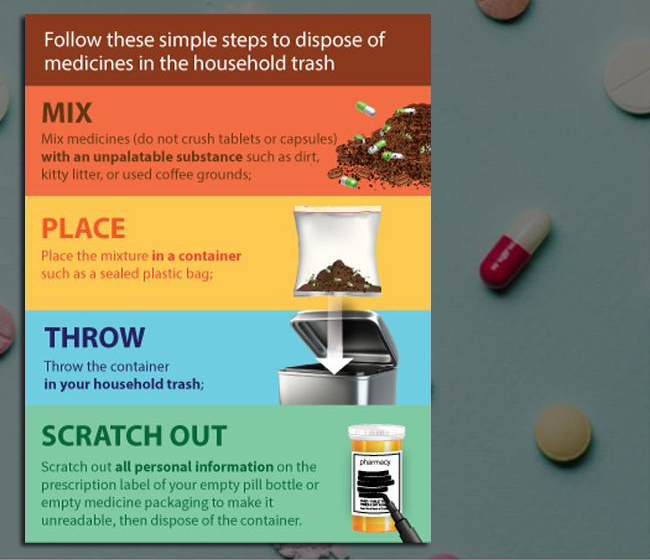 If no medicine take-back programs or DEA-authorized collectors are available in your area, and there are no specific disposal instructions on the label, the U.S. FDA says you can also follow these simple steps to dispose of most medicines in the household trash. More information can be found via FDA's "Disposal of Unused Medicines: What You Should Know" Web site.